Idemitsu Electronic Materials Korea Co., Ltd. a wholly owned subsidiary backed by Idemitsu Kosan Co., Ltd. has completed construction of a plant for manufacturing OLED materials in Paju, near Seoul, and plans to begin production. Commercial shipment of the products will be started at next spring, after completing the quality inspection and production processes. The products manufactured in the plant is expected to sell the products in markets including Japan, South Korea, Taiwan, Europe and other markets in addition to South Korean market. Idemitsu Kosan will strengthen its stable supply to customers by making this plant an overseas production base, while joining its OLED materials production facility in Omaezaki, Shizuoka Prefecture, Japan as another production base. The South Korea Plant have been growing rapidly in recent years as development advances of OLED products for uses such as displays and lighting. In 2011, Idemitsu Kosan established Idemitsu Electronic Materials Korea Co., Ltd. in South Korea to enhance its structure for supplying OLED materials, by increasing its production capacity and increasing the number of production base. 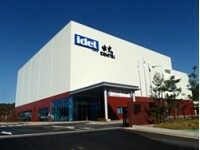 In March 2012 Idemitsu started construction of the plant in the Dangdong Industrial Complex in Paju-city, Gyeonggi-do. The factory buildings were completed at the end of September 2012, and production of OLED materials will begin soon.